Go forward in time to July 2008. It's that time of the year again. Tomorrow, I'll leave for a pretty tight but extremely exciting trip in Europe, from one corner in the west, to the other in the east of the continent. Really tight, but I'm sure it's gonna be a hell of fun. First stop is A Coruña, where I'll meet the Igalia crew for a few days, in order to get to know them a bit more personally, learn a bit more about the company and my future home, and of course, a little bit of work. Next stop is Madrid, where I'll attend the fifth GUADEC Hispana. This year's conference will take place in the Fuenlabrada campus of the Universidad Rey Juan Carlos, and it really promises interesting days. I'll give a small talk on how to extend the Eye of GNOME Image Viewer, so if you are interested on having fun with images, metadata, and that sort of stuff, you're more than welcome. You probably imagine my final destination: Istanbul, in Turkey, where most of the GNOME people will gather for GUADEC, the GNOME Conference. I'm really excited, because I always wanted to visit Istanbul, and mixing together a bunch of good friends, the project I love, and one of the most beautiful cities in the world, can't possibly be bad at all. It's gonna be like nine flights in less than 15 days. Not bad, uh? Since a few months, my dad has been using Ubuntu in his new desktop computer. And he is a happy user. He had been using Windows 98 in his old computer for quite a long time, so it wasn't a difficult task to convince him that Ubuntu wouldn't be difficult to learn for what he was used to do: write documents, prepare spreadsheets, play Tetris and Freecell, and listen music. So, when we got his new computer ready, I downloaded and installed Hardy Heron on it. The experience has been really pleasant. Now he fully understands what GNOME is, and what do I do with my free time. He also jokes a lot every time something doesn't work immediately for him and tells me he is going to call Pedro to complain. I laugh everytime at that. He now listens to his music with Rhythmbox. He was used to the good old Winamp, but once he understood the library organization of music in Rhythmbox, he told me that this is far superior. I've also helped him to set up a Last.fm account, and now he scrobbles his listening habits. Also, he listens to the Last.fm streams with the Last.fm client. Last but no least, he is an avid Gnometris player. During the first weeks, I had to help him installing the software updates. I insisted to him that it was important to run them regularly, so that his system becomes more and more stable. Yesterday I realized he hadn't asked me for assistance in a long time, and asked him about it. It was really pleasant to hear him tell me that he's been doing all the software updates without needing my help at all. When I think of all this, I realize how far we've come. People may think that GNU/Linux is only for geeks, but seeing my dad, enjoying using his computer without worrying about viruses, without being afraid of messing with the system, and actually being able to do his daily routine at the computer, makes me feel proud. We all should feel proud. So, what's your story? Does any of your non-computer-literate relatives/friends/significant other uses GNOME or other Free Software environment? I would love to read others' experiences. 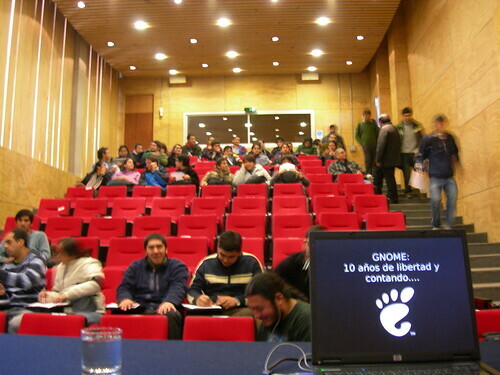 A few weeks ago I was invited to give a talk about the GNOME Desktop at the Primera Jornada Linux in the Instituto DuocUC, Plaza Oeste. Sometimes I feel that it may become boring for people to attend this kind of talks, but in this talk, when I asked the crowded audience to raise their hands if they had ever used GNU/Linux or GNOME, only a very few did it. That means that there's still a huge amount of people who doesn't know about what we do and who could be potential users – enough motivation to give advocacy talks again and again. I'm loving my work. Still need to organize better my time – working at home can prove to be really challenging if you don't set your work hours responsably – but I'm improving. Can you trust the tracking systems of your local postal service? 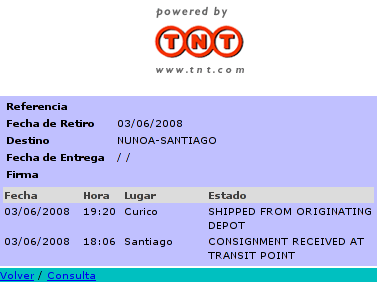 I don't get how could it be possible that the documents left Curicó one hour after they arrived in Santiago. Go backwards in time to May 2008.